It’s been a weird week with Hurricane Sandy. There’s still no power at my work office in NYC, so I’ve been out all week and cabin fever is setting in! I finally ventured out today and it was nice not to be stuck inside. Luckily, there was no damage where I am, but it’s sad to see all the photos from New York, Hoboken, the Jersey Shore and all the places that were badly affected by the storm. Hope you all fared ok if you were in the path of Hurricane Sandy! I wanted to share a tasty meal I made during the storm. I’ve posted about homemade pizza in the past, but I figured I would share this new combo. I bought pizza dough from Trader Joe’s before the storm hit. I sauteed some garlic, dried basil, dried oregano, salt, and pepper in vegan butter. I used this as a garlic butter base rather than tomato sauce. 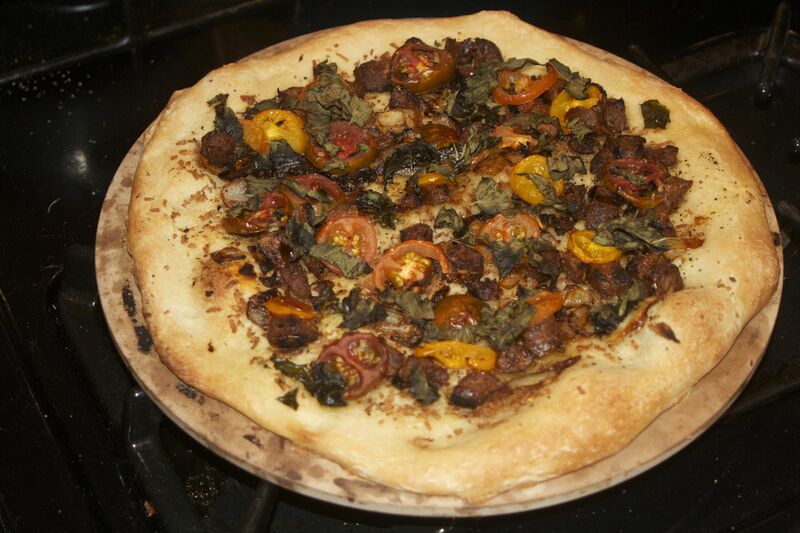 Then I topped that with sauteed onions, vegan sausage, fresh slices of cherry tomatoes, and fresh basil. It made for a yummy and quick meal in the midst of all the rain and wind. The storm left me thinking…how do vegans prepare for emergency situations? We stocked up on vegan granola bars, vegan soups and chili, almond milk, cereal, pasta and sauce, Annie’s Bunny Fruit Snacks, and all the usuals like water, bread, etc. What do you stock up on when a storm is headed your way? Anyone have any good tips? Also, keep an eye out for the Virtual Vegan Potluck taking place tomorrow. There should be lots of yummy recipes! After a bit of a hiatus, I’ve got some new recipes to share. This weekend I was craving toasted pumpkin seeds. When carving a pumpkin as a kid, rather than throw away the seeds we would save them and toast them in the oven. It makes for a really yummy snack! If you usually just throw the seeds away, consider saving them this year to try out this really simple recipe. Preheat your oven to 325°. Cut open the top of your pumpkin like you would normally do to carve a pumpkin. I used a regular serrated kitchen knife and cut a wide circle around the stem. Scoop out the gooey insides of the pumpkin and separate out the seeds. Place the seeds into a colander and rinse away any extra pumpkin goo. Pat the seeds dry. Drizzle a little olive oil on a baking sheet and spread the seeds out in an even layer on the pan. Sprinkle salt, pepper, garlic powder, and any other spices you like on the pumpkin seeds. Toss the seeds so they are evenly coated. I decided to keep it simple with the spices I used, but you can get as creative as you like. Place the pan in the oven for 10 minutes. After 10 minutes, toss the seeds so they get evenly browned. Toast the seeds for an additional 15 minutes. The seeds are done when they are light golden brown. There were so many awesome recipes shared during the Virtual Vegan Potluck that it was hard to figure out which ones to try first. This recipe was shared on the blog Bringing Europe Home. I’ve always loved roasted peppers, but had never tried making them myself, so this was good motivation to try it out. It was a pretty easy process and the peppers were really yummy! Check out the original recipe on Bringing Europe Home. She goes through several methods on how to make these, but I’ll tell you the way I ended up making them. Drizzle some olive oil on a baking pan. Place the three whole bell peppers in the pan along with about 10 whole peeled cloves of garlic. Set your oven to broil, and put the peppers on the top rack of the oven. Check the peppers regularly. They’ll need a few minutes per side. The skin will start to char and turn black. Rotate the peppers as they broil so that each side gets charred and black. Take the peppers out of the oven and let them cool down a bit while you prep the other ingredients. Chop the basil and parsley and place in a medium sized bowl. You can use as much or as little as you want, but I liked having a lot of parsley and basil. Add about 3 Tbsp of olive oil. Sprinkle a little salt, pepper, and dried Italian herbs in the bowl. Once the peppers are cool enough to touch, peel off the charred skin. I just used my fingers to peel it off, but there are some other tricks on the Bringing Europe Home recipe if you want to try them out. Pull out the stem and center of the peppers and remove any seeds. Slice the roasted peppers into strips. Add the pepper strips and whole roasted garlic to the bowl of herbs and olive oil and toss so the peppers get coated. Eat the peppers as they are or slice a baguette and spread the peppers on top. This makes for a really pretty and yummy appetizer! Welcome to my contribution to the Virtual Vegan Potluck! This recipe is one that my mom came up with, and it’s one of my favorite recipes of hers. It’s a vegan version of a classic meal. We often make this when we need to bring a meal to share in real life, so it seemed fitting for the Virtual Vegan Potluck as well. It’s easy to make up a big pan of vegan Shepherd’s Pie and it’s well received by vegans and non-vegans alike. 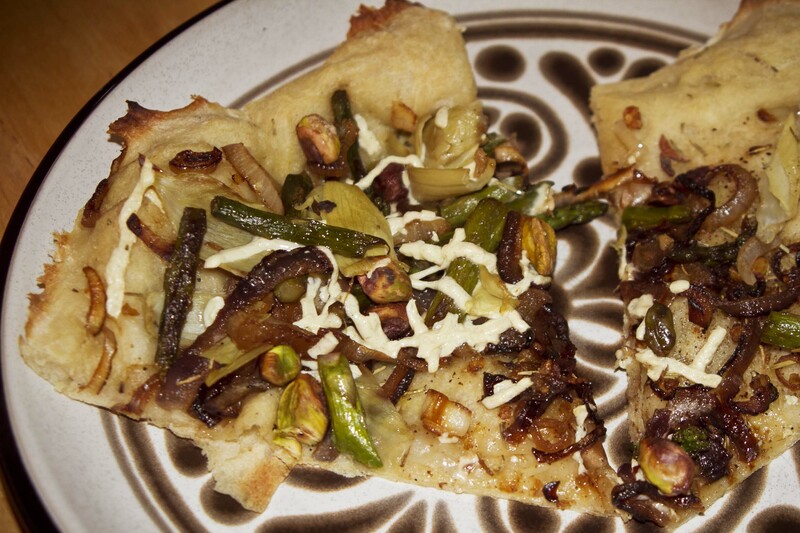 Be sure to check out the other recipes in the Virtual Vegan Potluck by following the links at the bottom of this post. A special thanks to Annie from An Unrefined Vegan for setting all this up! Enjoy! Chop the onion, shallots, green pepper, and celery. Press or mince the garlic. Saute these ingredients in a little bit of olive oil. Add the Smart Ground crumbles and continue to saute. If you are making gravy from a dry mix, follow the directions and make the gravy in a separate pot. My mom uses Streit’s gravy mix. I couldn’t find this, so I used Imagine Vegetarian Wild Mushroom Gravy. Once your gravy is ready, add it to the sauteed veggies and soy crumbles. Add the tomato paste. Stir the mixture while bringing it to a simmer. Add in the frozen vegetables and corn and continue to simmer until the vegetables are tender. Season with garlic powder, salt, pepper, and paprika to taste. Lightly grease a large casserole dish. Pour the veggie and soy crumbles mixture into the dish and set aside. Make a big batch of mashed potatoes. You can make them from a mix to save time, or make them from scratch. To make them from scratch start by boiling your potatoes until they are soft (check them by sticking a fork in to test firmness). Press or mince the garlic and saute it in a little olive oil. Once the potatoes are soft, run them under cold water to cool them down and drain all the water off. The skins will be loose, so you can peel them off pretty easily by hand. Peel all of the potatoes and return them to the pot. Using a potato masher, mash all of the potatoes until smooth. Add the soy milk, vegan butter, garlic, garlic powder, salt and pepper to taste. Stir until well combined. Spread the mashed potatoes on top of the veggie and soy crumble mixture in the casserole dish. The mashed potatoes should completely cover the bottom layer. Brush a little melted vegan butter on top. Bake at 375° until the edges bubble and the mashed potatoes are golden brown on top. Don’t forget to keep browsing through the Virtual Vegan Potluck! There are many wonderful recipes waiting for you! Start at the Beginning at Vegan Bloggers Unite! This recipe originally comes from Heidi Swanson‘s book Super Natural Everyday. My sister made this recipe for us on a visit a while back, and I finally got around to making a batch myself. Of course I made a few changes, as I am known to do. Kale changes quite a bit when you roast it. The leaves become light and crispy. It’s an odd texture at first, but it really grew on me. The flavor combo is pretty unique too, but it will also grow on you. You’ll soon find yourself craving some toasted sesame soy-saucy kale! I bought a tub of pre-chopped, pre-washed kale from Whole Foods and that cut down on prep time a lot. I also tried making this recipe with frozen kale, but it doesn’t turn out the same. It was still tasty, but the frozen kale is too wet and doesn’t get crispy like fresh kale does. Preheat the oven to 350° and place two racks on the top half of the oven. Prep your kale by removing thick stems and ribs and roughly chopping. Make sure you wash the kale well as it can be sandy. Pat the kale dry after washing to remove excess water. Whisk together the olive oil, sesame oil, soy sauce, sesame seeds, and garlic in a large mixing bowl. Add the kale and coconut to the bowl and toss well until evenly coated with the oil/soy sauce mixture. Spread the kale in an even layer on two baking sheets. Bake for 15-20 minutes, and then check, alternating racks if need be. The kale should be crispy and the coconut should be turning golden brown. I had to leave mine in a bit longer. 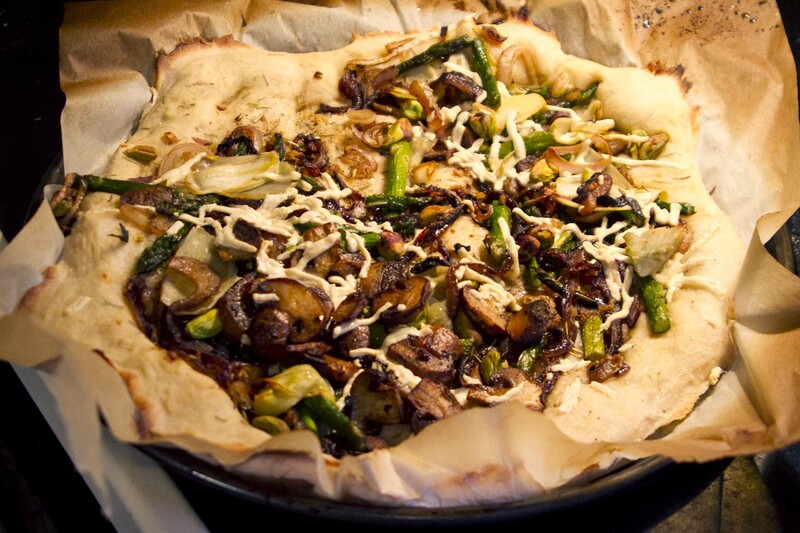 Once it’s crispy and golden, remove it from the oven, let it cool a little, and enjoy! 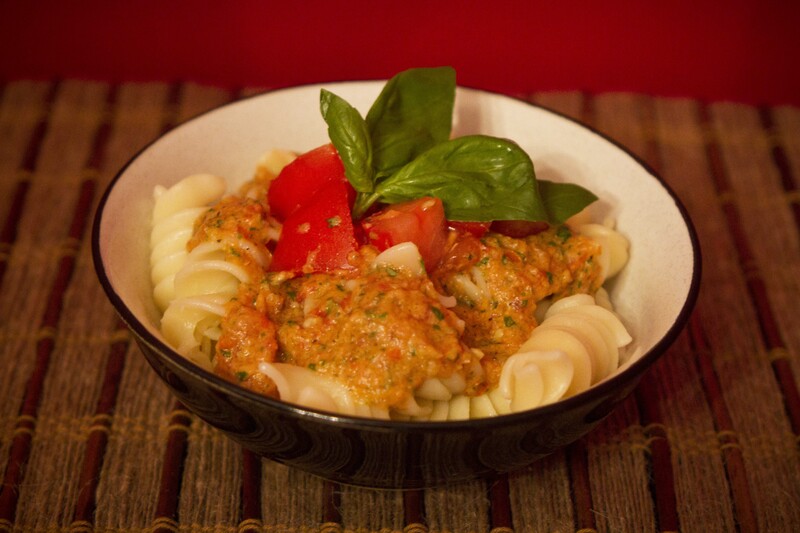 One of my favorite quick recipes is “Pasta with Fresh 5-Minute Basil Tomato Sauce” from Sarah Kramer’s book La Dolce Vegan! Vegan Livin’ Made Easy. She has a few different vegan cookbooks, and if you’re vegan you probably already own at least one. I stick pretty close to her recipe, but do a couple things a little differently. I can’t seem to ever follow recipes exactly! Here’s the way I do it. While it’s cooking, chop one tomato and set it aside for later. Finely chop (or press) the garlic and sautee it until golden. In a blender or food processor, blend together the remaining tomatoes, oil, garlic, basil, salt, pepper, and oregano until chunky. I recommend putting the tomatoes in the blender last so the other ingredients get chopped and mixed in before the tomatoes turn completely to liquid. The sauce can be a little watery, so if you don’t want that, you can squeeze out the seeds of the tomatoes before blending. Drain the noodles and place in bowls for serving. Add sauce, chopped tomatoes, and a sprig of basil on top.